durability. 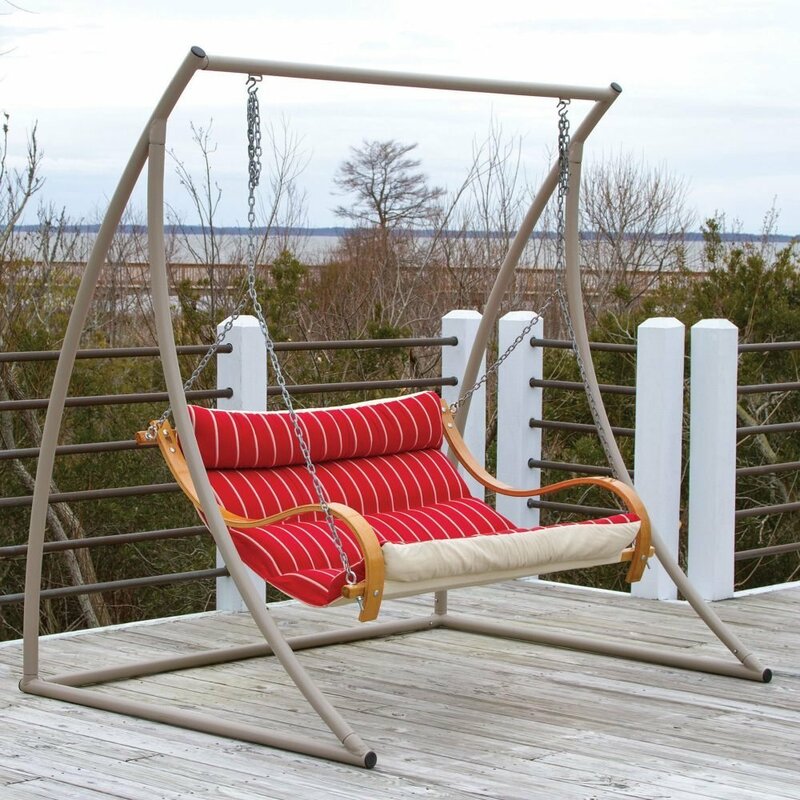 In some cases, you may be required to buy the swing separately. This is often the case with porch chairs that do not come with a stand of their own. If you are in such a situation then choosing one is a matter of considering features and design specifications. Below is a comparative review of three amazing options currently on the market. No matter if you want a stand to replace your old broken one or one to set up your new swing, you will have an idea where to start shopping. swing chair using fabric of metallic cords. finishing. This gives it a vintage rustic effect. It is large – This allows you to set up large swings on the frame. 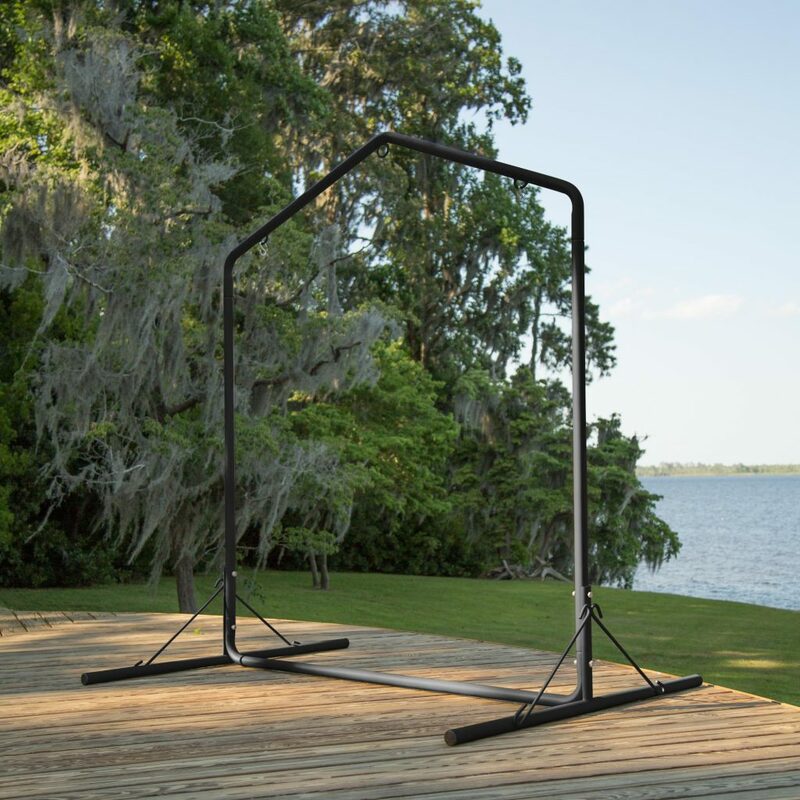 It is stable – This contributes safety to the swing’s overall safety ensuring you don’t end up toppling over and getting hurt. The iron is not weatherproof – With time, it succumbs to corrosion and begins to rust. Complicated assembly – The unit does not come with all the required bolts and nuts. You might therefore have to purchase these on your own. of aesthetics. It is, however, less durable than the other two options. translate to the stand’s ability to safely hold most 2-seater porch swings. It is strong and durable – This is as a result of the frame’s heavy duty steel construction. The metal is strong and also capable of resisting corrosion. It is gentle on surfaces – The flat bar design on both side frame and at the back ensure stability without damaging your yard or your porch floor surface. It is easy to assemble – It has few pieces that fit perfectly together. This makes it very easy to put it together without having to rely entirely on instructions. 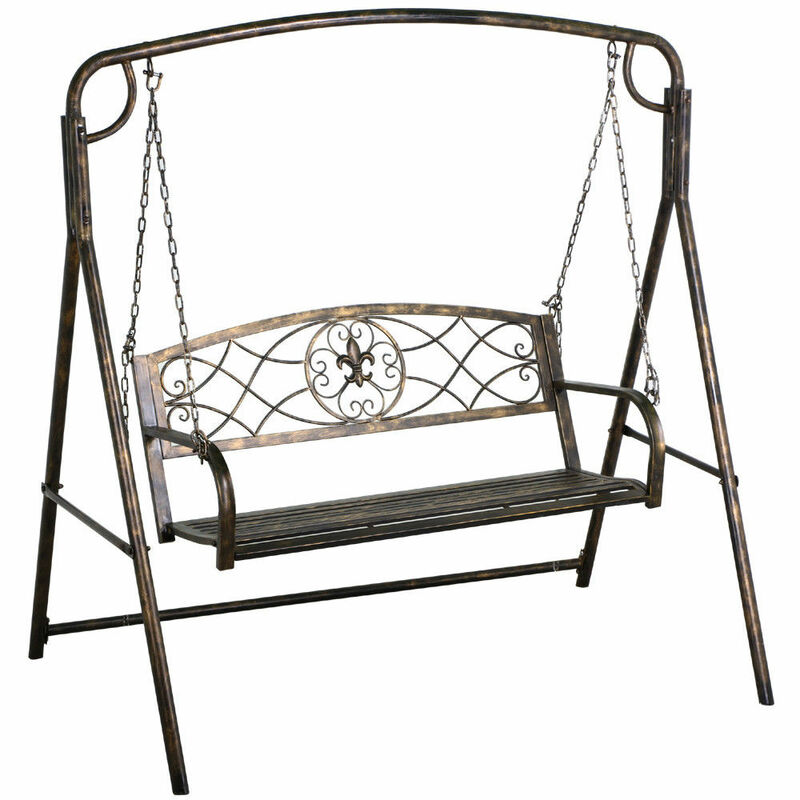 It is expensive – This stands falls in the high end category making it more expensive than many full porch swings. It is aesthetically bland – With the plain white finishing, the swing does little to contribute to the set’s physical appeal. Tastes are different! Read our review from a slightly different point of view: The 7 Best Patio Swing Stands. ensures that you have a stable stand that can handle the job. However, you will have to compromise on aesthetics in order to enjoy these perks. comes in particularly handy when setting up porch swings with a single centralized connection system. It is very strong – The heavy duty steel makes it the strongest of the three stands. It can therefore easily support the weight applied without crumbling. It is very easy to assemble – The simple inverted T design makes it very easy to put together. All that needs to be done is insertion of the top bar to the 2 base frames. It has multiple connection options – This is made possible by the 3 connection ring design. nice classic aesthetic effect that makes it an outdoor décor centerpiece. want to spend too much money. looking for a high end option. This is because you can get the same performance and appeal with the other 2 cheaper options. These hanging chairs reviews are purely based on our personal experience or reviews from users who are passionate about sharing their experiences. We do not sell hanging chairs nor are we in any way related to any furniture company. Our aim is to help you choose the right hanging chair and guide you to get the best deal in the market. Hope you find your perfect hanging chair with us!